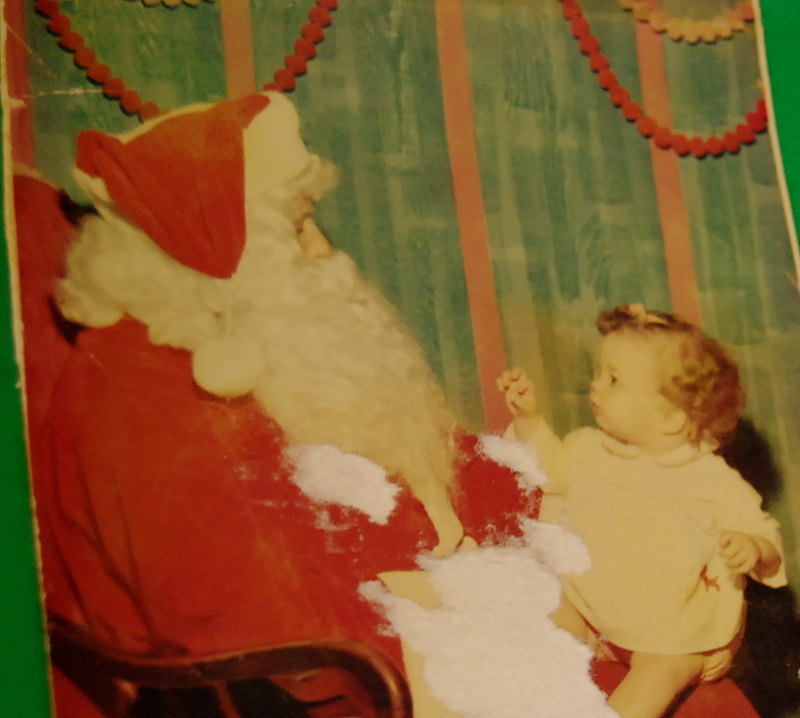 I remember Christmas when I was a little girl in North Carolina. As well as actual memories, I have memories that are probably just derived from stories mom and dad told combined with the pictures in the photo albums full of old pictures mom kept. Don’t you love looking back on old pictures? Christmas was a big deal when I was growing up. 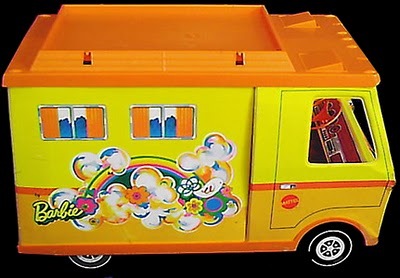 I remember receiving a bouncy horse when I was a toddler, and I rode many miles on that fella. I also got a nice electric train set when I was two years old. Don’t most dads do that? I mean really, when you get a nice train set for a two-year-old girl, dads, aren’t you really getting it because you want to play with it? (That is perfectly all right. It’s cute.) We have pictures of me looking on at dad with a quizzical look on my face as he intently puts the track together. Thankfully, “Santa” also brought me a little pink plastic doll bed and a new baby doll to keep me busy. I always, always, wanted a new doll. I think I was born aching to be a mama. Another year I got the Barbie Airplane, and Barbie and I were stewardesses. 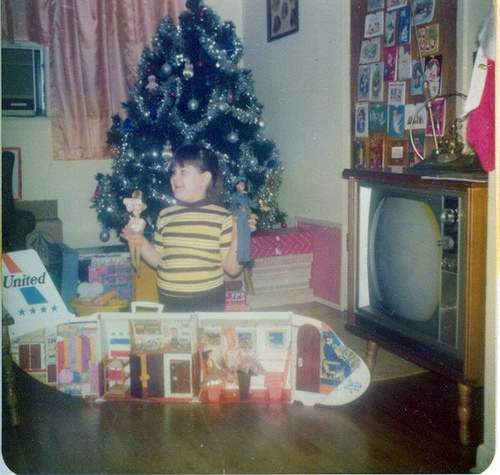 This picture isn’t of me, but it’s probably the same Christmas morning! So cute! My Christmas tree was not unlike hers, either, with the silver tinsel. Remember tinsel? I hear it’s making a comeback. Did you have that on your tree? Christmas is different for me now, and for all of you who are adults like me. The gifts are much more high-tech than they were in the 60s and 70s, and many dolls now have night club clothes and lots of make-up on their pretty faces. Kids are not outside playing all day like we used to; they are often inside playing video games and computer games and watching t.v. 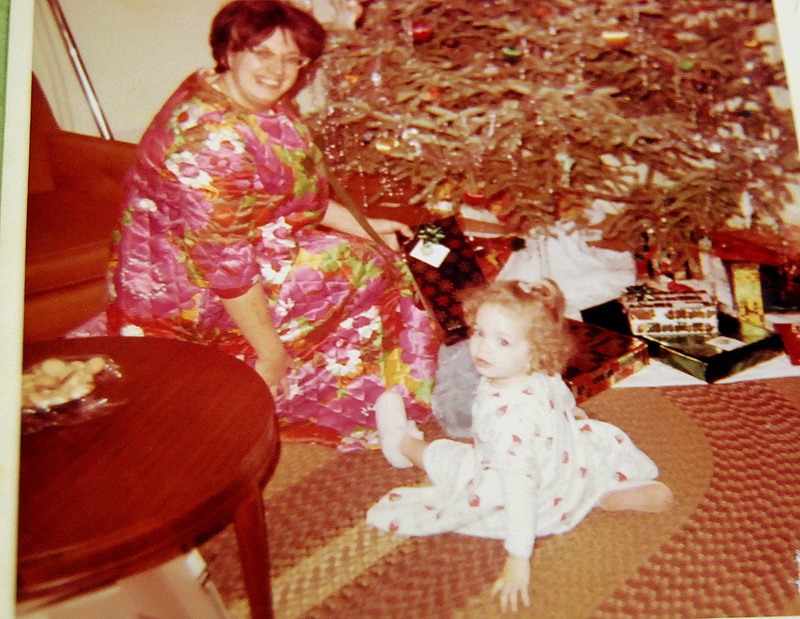 However, I think the wonder and excitement of Christmas is still the same. Children still get excited about Santa and wake their parents up too early to see what he put under the tree. It’s still exciting to drive around, looking at Christmas light displays in the neighborhoods nearby and go home to watch Charlie Brown Christmas or Rudolph The Red-Nosed reindeer. Even my three teenage sons like to cut out sugar cookies with me and make icing to decorate them with. (we do Christmas tree, Santa, bell, and star shapes using the old aluminum cookie cutters like mom used) and I love that! It’s such a fun time to be together and laugh and listen to Christmas music, even if it IS on satellite radio instead of a record player. 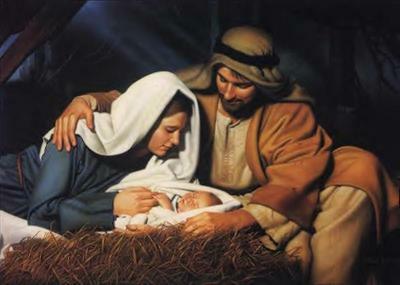 The best thing of all, though, the thing that has stayed the same for centuries and will never change, is the story of the birth of Jesus. In Luke chapter 1, starting in verse 18, the story is retold. It’s the greatest gift we’ve received, and no better one will be given. Make sure you give the real reason we celebrate Christmas some attention this year! You never know the hope it might spark in you or your family! I hope you have a very Merry Christmas, friends!